A long tubular part, especially as a component of a heat exchanger, that is characterized by a pattern of 180-degree bends alternating in two planes of bend that are 180 degrees apart in orientation. 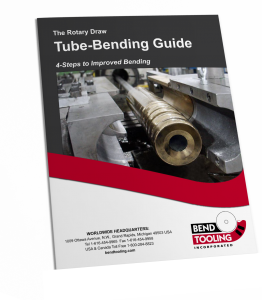 While the bends of a serpentine application are typically not intrinsically difficult to form — indeed, the “D” of bend is usually generous — they often must be formed without a mandrel, because the great length of the tube needed for the finished part exceeds the length of the bed of the bending machine. Setting the wiper at zero-rake and increasing the assist pressure can compensate for the absence of a mandrel if the bend specifications are not otherwise extreme.